When I was visiting Sweden, I got to stay at the brand new home of my friend, P. I knew she had worked hard and done lots of research on what the latest and greatest (and prettiest) trends were in home decorating. One thing I noticed, and loved, was her use of wallpaper. 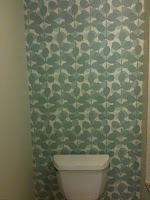 I haven't seen wallpaper in homes in quite some time, but it was used sparingly -- as an accent wall rather than the whole room -- and the paper patterns were absolutely lovely. The first room I tried was my bathroom. 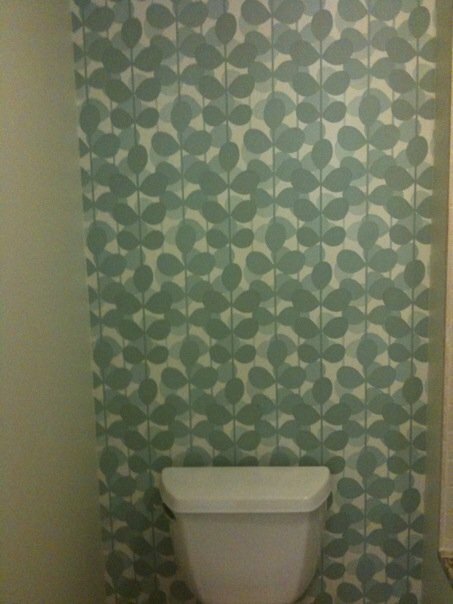 I found the wallpaper, and my mom was gracious enough to test out her wallpapering skills (she used to be the Queen of Wallpapering back in the day), and the result was a lovely accent wall in an otherwise sparsely decorated bathroom. Next project: bedroom wall. This one is trickier...it's a much bigger wall, and I am pretty particular about colors and patters in there. Wish me luck! Haven't checked your blog for a while. Love your Amsterdam pictures!